Go in the Wilderness est la plus récente réalisation de la cinéaste montréalaise Elza Kephart. Elle refait équipe avec la productrice Patricia Gomez Zlatar, avec qui elle avait fait ses débuts avec le film d’horreur Graveyard Alive. Tourné parmi les paysages saisissants de la Côte-Nord, Go in the Wilderness présente une nouvelle version du mythe de la création. Le film a été produit de façon indépendante à 100%, avec le soutien d’amis, de parents et de personnes qui ont contribué via le site de sociofinancement Indiegogo. Go in the Wilderness est présenté en première mondiale au Festival du nouveau cinéma dans la section Temps Ø. The origins of Lilith are, like most myths, cloudy and multifaceted. The most common explanation stems from the fact that there are two versions of Genesis in the Old Testament. In one version, man and woman both come from dust, and in the other, woman is created after man, from his rib. Some believe Jewish scholars found these discrepancies perplexing and invented the legend of Lilith in order to explain them away. They reckoned the first woman must have escaped, only to be replaced by Eve, in the second version. Little known fact: Lilith gave the women’s music festival Lilith Fair its name! Where did you first hear about Lilith? I first heard about Lilith in a book called “The History of the Devil”, in a chapter called “The Legend of Lilith”. There was something about Lilith’s story that immediately struck me as one I wanted to explore. How did it feel to go from the idyllic world of Eden to awake in a world you know nothing of, where there are countless dangers, hardships and difficulties, but also more beauty than there ever was in the sheltered world of the Garden. How to communicate concepts to someone who has no reference points, and how to show that she becomes aware of them, captivated my imagination. The legend of Lilith is very sparse, so I had a lot of latitude to play with, and to create my own interpretation. What were your influences for this film? Pier Paolo Pasolini’s mythic film cycle (The Gospel According to St-Matthew, Oedipus Rex, Medea), Lars Von Trier’s Medea, John Huston’s The Bible… in the Beginning, Atanarjuat, with a little bit of Alejandro Jodorowsky mixed in! We shot the Wilderness in two areas: on the North Shore of Quebec, 1200km North East of Montreal. There, we shot on one of the islands of the Mingan Island Archipelago, and around the towns of Havre St-Pierre and Baie Johan-Beetz. Then we moved to the Charlevoix region, where we shot partly in the Parc des Grands Jardins, and the Hautes Gorges de la riviere Malbaie. We shot Eden around Montreal and in the Larose Forest in Ontario. Critique par Charles-Henri Ramond - 2014-05-21. Cote: 3. Alliant paysages naturels hors de l'ordinaire et couleurs saturées, cet étonnant objet cinématographique nous plonge avec délice dans les méandres psychologiques du premier couple terrestre, Adam et Ève. 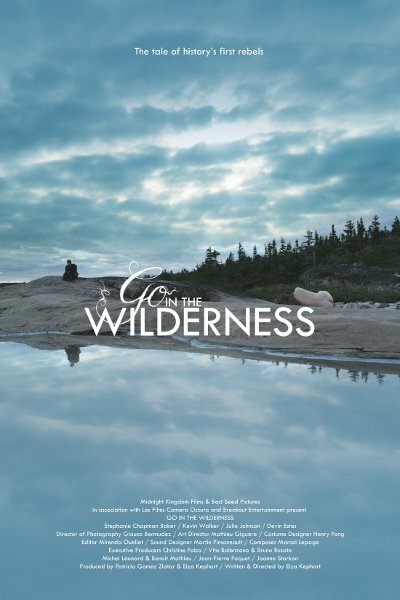 Réalisé avec peu de moyens et non sans un certain sens de la dérision, Go In The Wilderness est une agréable surprise dans un paysage filmique québécois trop souvent en mal d'idées.